There's no hard and fast rule that says gaming laptops have to be thick and heavy. Lest there be any doubt, meet Gigabyte's new Aero 14, a 14-inch ultrabook-like system with gaming chops. The Aero 14 measures 335mm x 250mm by 19.9mm (WxDxH) and weighs 1.89kg. If that's all we told you about it, you might assume it's a thin and light business laptop. And it is, albeit a colorful one that might be a little more attention getting than what you're comfortable lugging into a board room. But it's also equipped with discrete graphics—GeForce GTX 965M or 970M—for gaming once you've clocked out of work. 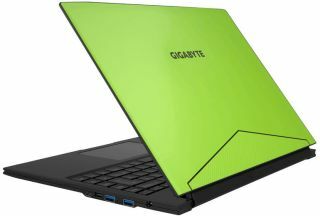 Gigabyte's Aero 14 features a QHD 2560x1440 IPS display powered by Intel Core i7 Skylake CPU options. There are two DDR4 SO-DIMM slots supporting up to 32GB of 2133MHz memory, and room for two M.2 PCI Express Gen3 x4 SSDs. The laptop supports dual-4K output via HDMI and mini DisplayPort connectors. It also has a memory card slot, three USB 3.0 Type-A ports, and a USB 3.1 Type-C connector that's of the faster Gen2 variety for a theoretical ceiling of 10Gbps. There's an auto-adjusting backlight on the low profile keyboard, along with five dedicated macro keys positioned on the left-hand side. You can program these using Gigabyte's Macro Hub software. Gigabyte claims up to 10 hours of run time on the 94.2Wh battery, though that's when tapping into the integrated graphics. As always, your mileage is bound to vary, especially if you're playing games instead of punching out TPS reports. The Aero 14 is the only thin and light gaming laptop on the market. Both the Razer Blade Stealth and Maingear Pulse 15 both come immediately to mind, though neither are true ultrabooks. Razer's Blade Stealth is thin and light too, but it relies on an external GPU for gaming. It will be interesting to see how Gigabyte prices the Aero 14 in comparison to those machines. Buyers will have a choice between three color options when the Aero 14 becomes available (no word yet on when), including black, green, and orange.